RHINELANDER CLASS: A YEAR LONG WHO DONE IT MYSTERY QUILT. SEW THE QUILT TO SOLVE THE CRIME! 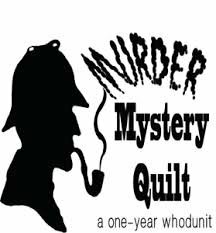 JOIN THE COMMUNITY OF THE MURDER MYSTERY QUILT, WHERE EVERY BLOCK YOU SEW HOLD A PIECE OF THE PUZZLE. READ ALONG WITH THE NICEST QUILTERS ON THE INTERNET, SHARE YOUR IDEAS AND INSIRATION, AND QUILT THROUGH THE YEAR TO CATCH THE KILLER. A UNIQUE YEAR-LONG QUILTING EXPERIENCE.